Avoid fence disputes by practicing fence etiquette—a good neighbor policy. If you follow zoning regulations and share basics with neighbors before construction, you can install a new fence AND stay on good terms with the folks next door. Observe boundaries: Don’t risk having to tear down that fence by going even one inch over your property line. Study your house line drawing or plat or order a new survey ($500 to $1,000) from a land surveyor to be sure of boundaries. Fence companies usually install a foot inside the line, to be on the safe side. Respect limits: Fencing companies obtain permits and must know local zoning regulations for height, setbacks, and other restrictions. Height limits typically are 6 feet for side and back yards; 4 feet for front yards. More restrictive rules often apply to corner lots, where blind curves can limit driving visibility. To avoid disputes, review restrictions with your fence company before choosing a fence. Follow HOA rules: Fencing companies are not responsible for knowing home owners association dos and don’ts; that’s your job. Unless you want to suffer committee wrath, and engage in a dispute, follow HOA guidelines. HOAs can dictate style, height, and maintenance. If your HOA wants all structures to match, you won’t have much wiggle room. Share your plans: No one likes surprises. Before installing, save yourself a fence dispute and have a conversation with neighbors. If property line issues exist, resolve them before installation. No need to show neighbors the design—that’s just inviting trouble. They have to live with your choice unless it lowers property values or is dangerous. 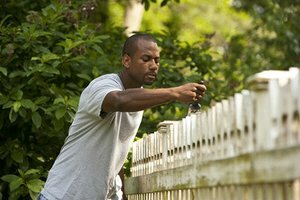 Put the best face outward: It’s common practice to put the more finished side of your fence facing the street and your neighbor’s yard. Maintain and improve: It’s your responsibility to clean and maintain both sides. If an aging section starts to lean, shore it or replace it. The term “fence” includes trees or hedges that create barriers. If you have a valid reason for wanting an extra high structure, to block a nasty view or noisy street, apply to your zoning board for a variance. Neighbors can comment on your request during the variance hearing. If your neighbors are damaging your fence, take photos and try to work it out with them first. If they don’t agree to repair it, take your fence dispute to small claims court. Award limits vary by state: $1,500 in Kentucky to $15,000 in Tennessee.